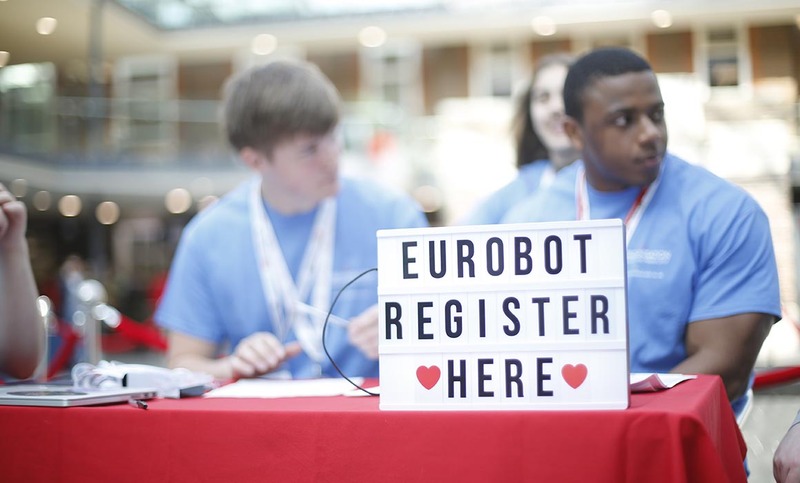 The UK finals of the Eurobot international amateur robotics contest were held at Middlesex University on 6 April involving 35 teams of young people from across Europe. Two teams of Middlesex students from BSc Computer Science and BEng Robotics competed alongside teams including Southampton University, UCL, Imperial College London, Aberdeen University, Dresden University and Birmingham University. Eurobot primarily aims to foster and develop interest in robotics among young people all over the world. It achieves this by asking students to build and design robots capable of completing set tasks without human control. This year’s theme ‘moon village’ saw robots competing to pick up lunar modules and different components on a 3 x 2 metre table. “Using an obstacle avoidance system, we had to navigate our robot safely around the table and score as many points as possible in 90 seconds,” says David Dovelinger, a first-year BSc Computer Science student from Hungary. Michael Heeney, Engineering and Computer Science Technical Tutor at Middlesex University, supported the students with building and programming their robots. “The students were doing lots of different types of programming such as Arduino micro controllers, python, and C++,” he says. “Some teams even simulated the table in 3D so they could see how the robot should move in a perfect scenario. In total, 1000 students and 200 teams participated in the Eurobot competition this year from 15 different European countries.